Question: We recently lost a family member. I have a preschooler and toddler. How do I handle the funeral events and talk to my children about death? 1) Modeling Matters: The most important consideration for you to remember is that your reaction and response to death will have a significant impact upon how your child responds to and views death. (See study about how even infants can “catch” maternal stress.) It is OK to cry and show that you are sad, as this is a healthy response, and it is important for children to learn that it is OK to feel sad and show your feelings. But large outbursts of upset feelings and externalizing your feelings through harsh, short and unkind behaviors to those around you (because you feel sad) will negatively impact your children. Also, having too mature of conversations about your fears and insecurities about dying in front of young children will also have a negative impact. Modeling healthy mourning behavior matters. 2) Don’t Avoid the Topic: Some young children will have lots of questions about dying, pain, sadness, funerals, religion, etc… and some will not. For children who are abundantly curious about death, it will be very important to answer their questions. 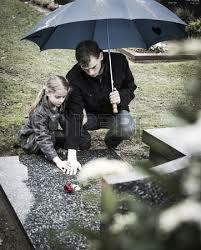 Do not ignore questions or leave children out of the funeral and events because their presence is uncomfortable. Experiencing death events is a very important part of a child developing a healthy life theory (see study of cross-cultural examination of children’s death experiences which led to a deeper understanding of human body and life theory). Give honest answers and feel free to be vague if it is needed. For children who seem disinterested in learning about death, respect their response, but be sure to offer yourself to them should they have questions or want to talk. 3) Prepare for Negative Behaviors: The topic of death can make us all a little anxious and therefore grumpy. Prepare for and be more understanding of negative, anxious behaviors. Children who are beginning to understand the finality of death will be a little upset by being confronted by mortality, just like adults. You may notice them engaging in controlling, reactionary and anxious ways. Pour on extra compassion and, most importantly, consistency and love. Try to keep a regular bed/eating/bathroom schedule. Bring their lovely or other comfort items with you as you travel for the funeral. Let your presence communicate that security and peace in this world can be found in you. 4) Do I let them view the corpse? The answer must be taken on a case-by-case basis. Some children will be very upset by the death of a love one and looking at the body will scare them and make matters worse. Other children will be interested and want to look. If your religion or custom dictates that everyone must look and/or kiss the cheek of the deceased loved one, then talk with your child before and after to prepare and debrief them about that custom. Be ready to offend family members if your child is upset by that custom as your child matters more than the tradition. 5) Will they understand what death means? Most children will grasp the meaning of death and life between four to seven years old. Their concept will continue to develop, but they will be able to understand death’s permanence for the first time during these years. A younger child may not understand that they will never see the deceased again prior to that time and if the deceased was a regular part of their life, you will likely see your child struggle with death over the next several months as they begin to realize that the deceased is not coming back. 6) Provide a Break: Death and mourning can be overwhelming for everyone. Try to find time in between the chaos of travel and funerals to do something fun. This will remind young children that life progresses, even after a death. Play is one of the best ways for children to work through their thoughts and feelings, so make sure to provide plenty of playtime each day. I also suggest scheduling a fun family activity as soon as you can. When we traveled home to California for my grandmother’s funeral, we took the kids to Disneyland. It felt odd to enjoy an exciting day during the midst of so much sadness, but it allowed my kids the opportunity to be young and carefree for the day and that is something I knew my grandma would have supported. For further reading, see this University of Michigan article “Children’s Concepts about Death”.